HighChill Refrigeration and Air Conditioning installs and maintains all types of heat pumps and refrigeration systems for your home, office, and commercial dwellings. We also take care of vehicle air conditioning, and provide a qualified inspection service for sign off of your commercial dwelling. We are Panasonic Specialists, and service all major brands. When you choose HighChill, as well as a great service you also receive Nick's personal customer satisfaction guarantee and warranties are available on all our products. Not sure of the right system for your situation? We will come and assess your area and provide a no obligation quote of the solutions available. 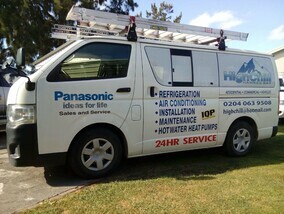 HighChill is your number one stop for air conditioning and refrigeration in Hawke's Bay. HighChill can attend to all your air conditioning and refrigeration needs, we are on call 24/7 for any emergencies, and can get your system back up and running quickly. Whether you are looking for a new install or repairs to a current system the HighChill team has the skills and experience you need. Once you are up and running we will keep in touch with annual maintenance reminders, ensuring your systems' longevity and compliance with the manufacturer's warranty. Heat pump supply, installation, servicing and maintenance. Installation and maintenance of refrigeration systems. Vehicle air-conditioning de-gas and re-gas. Commercial building sign off by Registered IQP - Hawkes Bay. The Heatsmart programme was set up to improve air quality in Hawke's Bay by reducing air pollution from home woodburners and fires. The HBRC Heatsmart programme helps Hawke's Bay ratepayers to get a warmer, healthier home by providing grants and loans. Our number one priority is to ensure your air conditioning and refrigeration needs are met. HighChill takes great pride in our quality service and great reputation in Hawke's Bay.